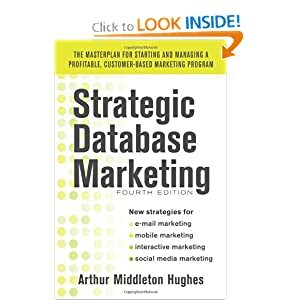 Most catalogers do not have a customer marketing database. Instead, they have a fulfillment system like Ecometry which works very well. It manages call center and web orders, fulfills them, permits marketers to see what products are selling, and which lists performed best. What more do you need? The goal of catalog operations is to find out which products and lists produce the most sales and profits. You organize each catalog and mailing to maximize sales and profits from each book mailed. The goal of catalog operations is to find your most valuable customers — those who give you 80% of your sales and profits — find out what they purchase, and make sure that your catalogs and mailings reach them with what they want to buy. The first statement aims at making each book a success. The second statement aims at increasing long term profits of the corporation. Why is the difference important? A drug chain asked an economist look at their use of shelf space on a profit per square foot basis. He found that some items — like baby diapers — took up a lot of space, but provided a small margin on each item sold. He recommended that their display be reduced. A database marketer examined the chain’s customer base to determine the 20% most profitable customers of the chain– those who produced 80% of the profits. He used a database to find out what these customers purchased. He found that baby diapers were very high on their list. He recommended that baby diaper shelf space be increased. Which was right? The marketer of course. If the most profitable customers could not find what they wanted in the store, they would go elsewhere, taking all their other business with them. Catalogers face the same quandary, but it is difficult to get the facts without a database. 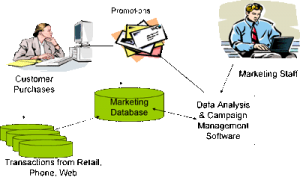 The key to understanding this picture is the arrow in the middle which shows that the customer promotion history is stored in the marketing database, along with the customer information and the transactions. 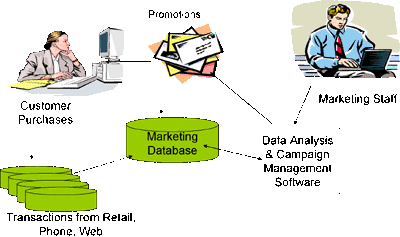 The marketing staff has access to the database through the web. Their database is maintained at a service bureau Using data analysis and campaign management software, marketers can compute customer lifetime value, and segment customers into meaningful categories — Gold customers, peak season customers, frequent shoppers, gift buyers, etc. With this data at their fingertips (or actually with the click of a mouse) marketers can see a 360 degree picture of each customer: what she buys, what channels she uses, the promotions she has received, and those she has responded to. Using the database the marketers can run tests and controls on each of the 1,000 or more customer promotions launched in a year (using catalogs, direct mail, email and web offers). They can determine not only the response to each promotion, but the long term effects on customer behavior of particular promotions. We can look at a couple of examples. Some companies have tried viral marketing: a system whereby customers use the catalog web site to send emails to other customers recommending products. Viral marketing captures for the database the name and email of the recommending customer plus the names and emails of those she recommends. But the database does more than that. It determines the subsequent behavior of the referrer and the referee. Does a person who is referred by someone else buy more than the average customer recruited through other means? Some catalogers have found this to be true. Does the person who does the referring (the advocate) change her behavior as well? Some catalogers say “Yes!” This can be tested using control groups. Thank the referring customer for what she has done. Reward her in some way (with no rewards for a few controls). Set up additional viral marketing opportunities. Follow the customer and the controls for months afterwards to see how their lifetime values have been modified by the experience. Most catalogers have found that total annual sales to multi-channel customers are larger than those to single channel customers. How can you use this information to modify customer behavior to increase sales? Sears Canada did just this a few years ago. They determined that the average catalog customer spent $492 dollars per year. The average retail customer spent $1,102 dollars per year. How did they implement that idea? Sears used the findings to change the location of the catalog desk in their 130 retail stores. The catalog desks were moved to the most used entrance of the store. Throughout the stores, Sears created outposts where they put copies of the catalog. At each outpost, there were telephones for immediate access to the call centers. Selected catalog pages were displayed throughout the store, so if you were in the footwear division, you found catalog pages laminated on the wall. If you couldn’t find the size or style you wanted, you could pick up a phone and order it. One of the key uses of a customer marketing database is the ability to do research on customers and what they buy. One customer looked into the buying history of people who started off with sale items, versus those who began by buying regular priced items. Their assumption was that regular price item customers would have a better long term value for the company. They were wrong. They found that, contrary to their expectations, many sale priced item customers provided more total revenue per household than regular priced item customers. This finding led to a revision in their marketing strategy, change in their catalog pages, and increase in their bottom line. This finding, we should add, is not a universal truth. Many catalogers will find a different answer when they do their own analysis. The point in the story is that without a database, most catalogers are going by hunch and intuition, rather than by an analysis of the facts. So why does a catalog marketer need a customer marketing database? To do the analysis and execute the strategies necessary to increase profits by more than they could without the database.